Twas' the week before Christmas and all through the days, everyone was preparing for next weeks craze. Wrapping had started - gifts under the tree, And lunches were made with festive glee! On Monday, Little Miss had a gingerbread man sandwich made from Udi's gluten/nut/dairy/soy free bread. It was filled with SunButter sunflower seed spread & honey. 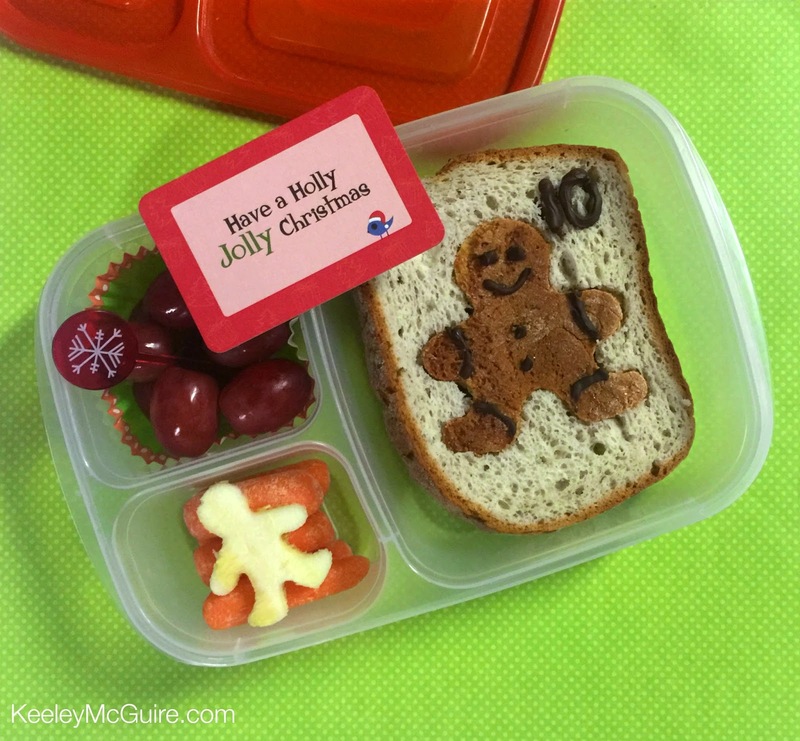 The details on our gingerbread man were made with melted Enjoy Life Foods chocolate chips melted down and piped on. She also had red seedless grapes, carrots, and a zucchini gingerbread man cutout. I also packed a sweet Lunchbox Love Note in her EasyLunchboxes container. Tuesday with 9 days left, I kept it simple with two turkey & ham sammies on our Udi's GF bread with a Santa & reindeer cupcake ring in the center of each. Also packed were snowman noses (carrots), candy cane apples, and two Kinnikinnick Foods gluten/dairy/nut free cookies (like an allergy friendly Oreo!) 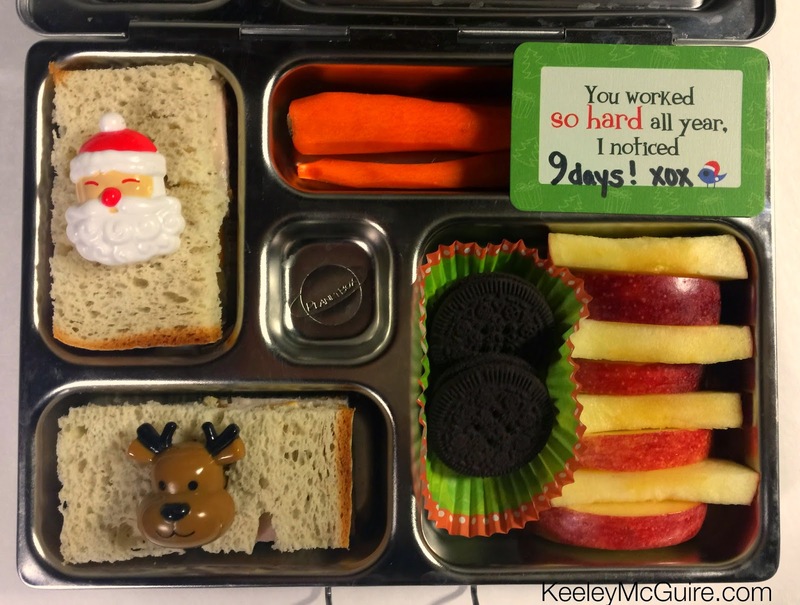 + a sweet Lunchbox Love Note in a Planetbox container. I find a great deal of importance in teaching Little Miss about the religions of others - especially when it's close friends. I want her to be knowledgeable and respectful, as I would want them to be to us. Since there were 8 days left on Wednesday, it also marked the beginning of Hannukah - which is also 8 days. It was great getting to talk to her about it while we made lunch! 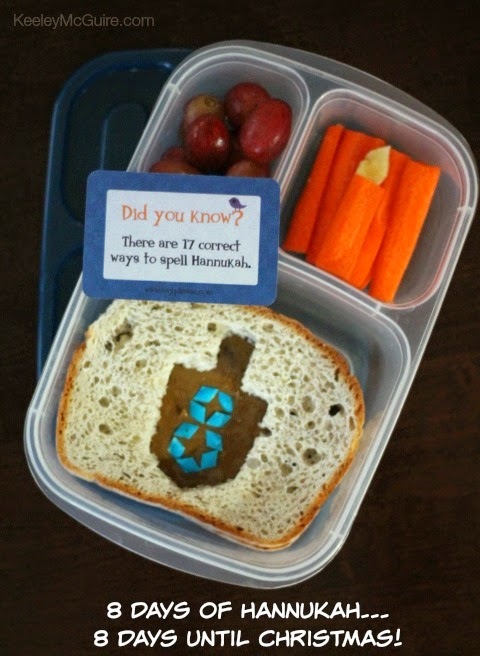 Plus, we loved incorporating our Hannukah Lunch Box Love Notes in our EasyLunchboxes container. She has a dreidel cutout from her SunButter & chocolate soy butter mixed sandwich. I put blue sprinkles in the center to look like the number eight. She also has grapes and carrots. I cut a slit into the top of one of the carrots and made the flame using yellow squash slice to look like a candle. 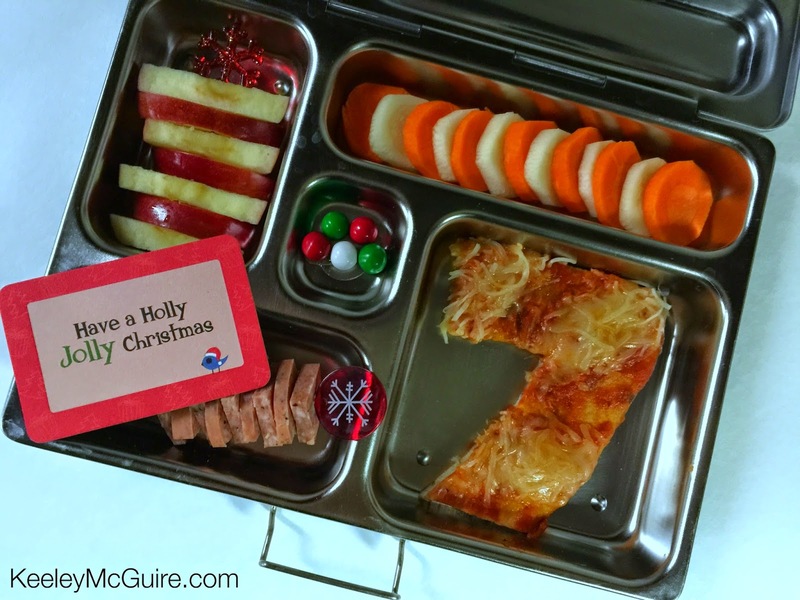 Seven days left on Thursday, so I was inspired to make her a candy cane shaped & decorated pizza in her Planetbox container. We also packed yellow & orange carrot coins, candy cane apple slices, and meat dices. Oh, and some gluten & nut free Sixlets, as a treat. I seriously did sing that in my while making Friday's lunch with 6 countdown days left. 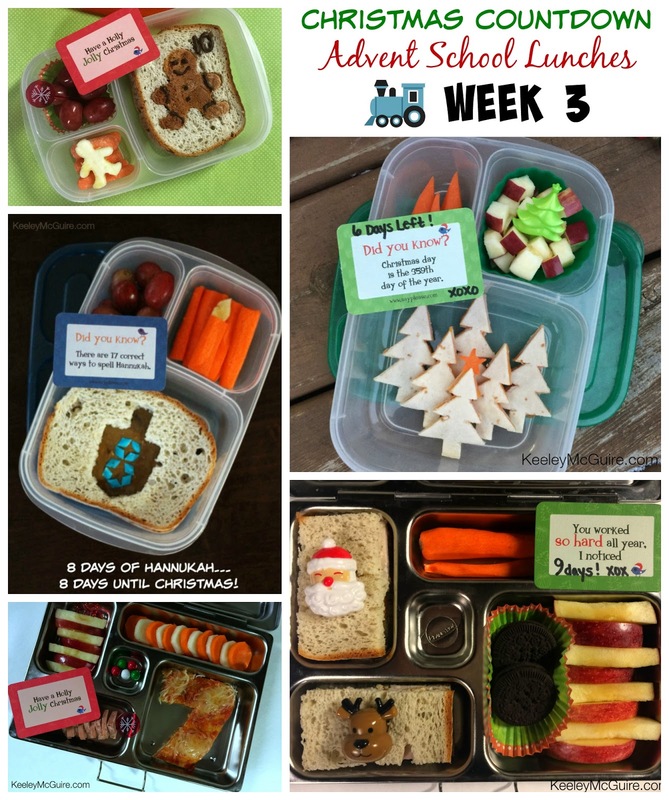 Also packed are apple dices, carrots, and a fun LunchBox Love Note in an EasyLunchboxes container.